It’s June again – one of our favorite months because it brings WSU researchers to Seattle to share technologies developed in the lab with local life science and cleantech industries. 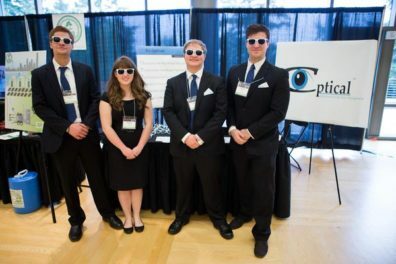 This post is your guide to the WSU technologies and startup companies you can see at Life Science Innovation Northwest June 1-2. Wounds inflicted on the battlefield are particularly prone to infection because the soldiers do not have immediate access to medical care. Haluk Beyenal has developed a medical treatment that could be applied directly to a wound without a medical professional present, and effectively kills the biofilms that lead to infection. Using low-voltage electrochemical currents in carbon fabric, Dr. Beyenal’s discovery produces the hydrogen peroxide needed to kill the biofilms. The technology can be used in a range of environments since it does not need to be refrigerated like antibiotic wound dressings. It also avoids issues of antibiotic resistance, and is more cost-effective than current wound dressing options. Initial lab tests have shown significant decreases in biofilms within 24 hours, and Dr. Beyenal is now looking for funding to start testing in animal models. As our climate continues to change and the human population is steadily growing, it is crucial to find ways to reduce human impact on the environment, and to grow crops that can withstand harsh conditions. WSU researcher Hanjo Hellmann has discovered a way to control processes in plants that could provide solutions for both of those challenges. By studying the fundamentals of plant stress physiology, he is in the process of developing a biotechnical platform to significantly increase the survival, growth and production of crop plants, especially in unfavorable environmental conditions. By selectively targeting and changing the expression of a specific proteins, Hellmann found that he can increase seed oil production, which could improve the production of biofuels and food-related products. By controlling those same proteins, he can also improve the plant’s response to harsh conditions such as draught and salinity, allowing the plant to continue thriving. Dr. Hellmann is now looking for investment to continue research in other plant models. Advancements in cell phone and diagnostic technology are opening doors to portable tests that will give details about human health, plant health, and food quality on a smart phone. A key component of diagnostic technology is a device that reads and analzyes microplate trays that have a sample of the specimen being tested. Current equipment can only be operated in a lab with well-trained professionals. There are several mobile phone-based portable microplate readers under development, but most are expensive to manufacture, difficult to scale up, and do not provide high resolution results. WSU researchers Li-Ju Wang and Lei Li have developed a microplate reader using a lens with prism-array technology that can detect more information than current mobile options, resulting in more and better data. The hardware Drs. Wang and Li developed is also more affordable than current options. Early lab testing is demonstrating the variety of industries that would benefit from this technology – from farmers who want to diagnose the health of plants in the field to healthcare professionals who want more consistent diagnostic data to determine the health of their patients. The team is seeking out research companies, as well as healthcare, agribusiness and other industries that are interested in partnering on clinical research to determine how this technology can be adapted to different diagnostic needs. In addition, the research team is looking for software developers to partner on development of a user-friendly smartphone app that can display results from the diagnostic testing. According to the Center for Disease Control (CDC), over 29.1 million Americans are diabetic and 86 million are prediabetic. Deaths worldwide due to diabetes are predicted to increase by 50 percent in the next 10 years, putting diabetes on track to becoming the seventh leading cause of death globally by 2030. To prevent further complications, it is imperative that people with diabetes have consistent and reliable blood glucose monitoring. Co-Optical is developing a non-invasive blood glucose measurement device to help aid in consistent monitoring. According to the World Health Organization there are more than 16 billion injections administered in developing countries, and almost 7 billion of these are contaminated. Engage is developing a product, SafeShot, that is a cap that attaches to the top of multi-dose medication vials. Within the cap there is a sterilization layer that sanitizes needles before they enter the vial protecting from blood borne pathogens such as HIV, Hepatitis B, and Hepatitis C.